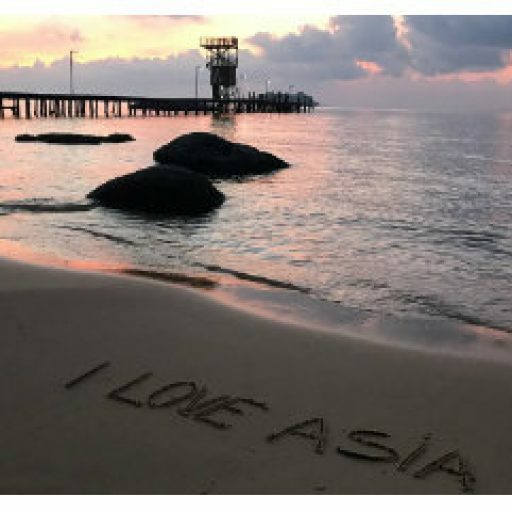 Koh Ta Kiev - the most beautiful island in Cambodgia | About various things! Koh Ta Kiev is, in my opinion, the most beautiful island in Cambodia. 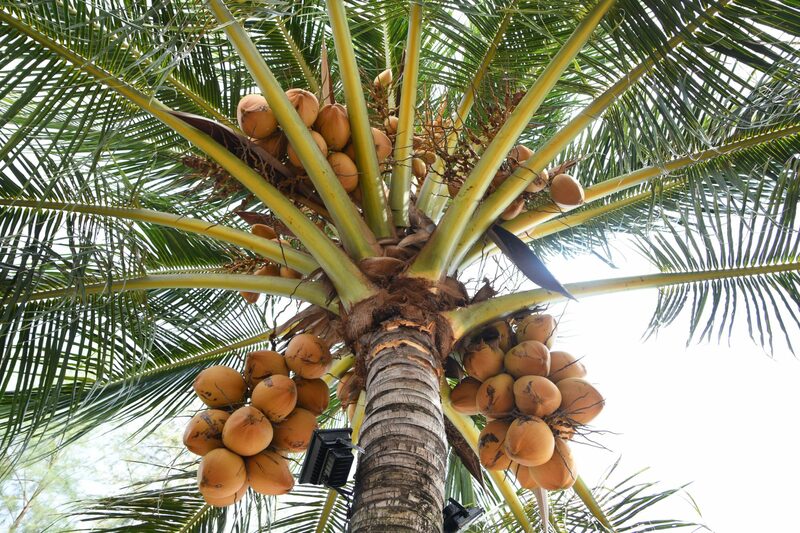 Koh Ta Kiev is the paradise island of Cambodia, a place where tourists have not yet flown, a corner of pure heaven where man can feel nature as it is. 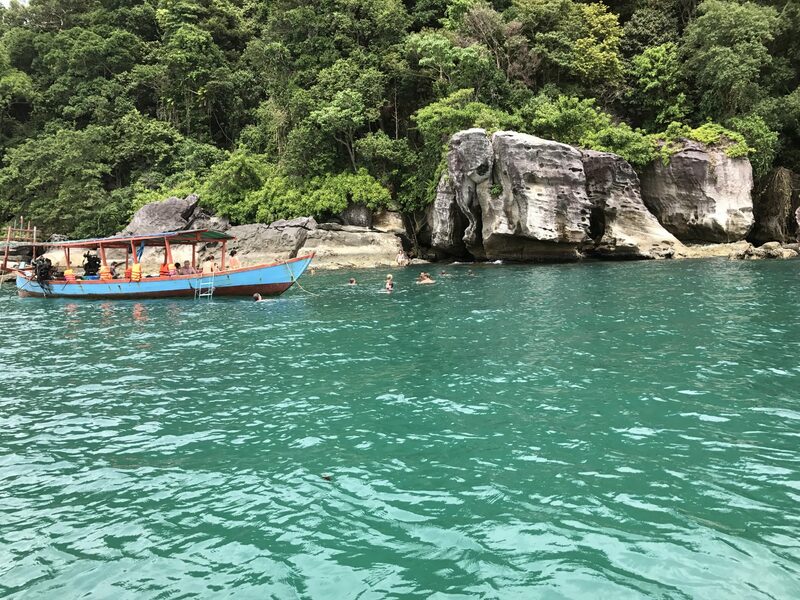 Cambodia has many beaches and beautiful islands, but Koh Ta Kiev is still undiscovered, it is pure. 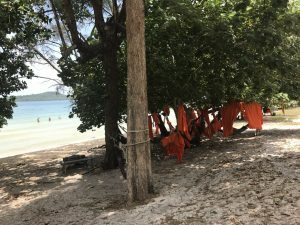 A freshly squeezed mango juice, an chaise longue with an umbrella to send away the 40 degrees outside, and some of the islands that grew merry from the sea were the perfect morning image in Cambodia. We are on the beautiful terrace of Harmony Home where we were staying on Otres 2 beach, in an almost perfect silence, disturbed only by the noisy waves and by one tourist in the attempt to cross the beach from one end to the other. Abandoning our feet in the sand and staring at the fruitful cocoon above us, we realized late that a very cheerful and chatty Cambodian man was sitting next to us. 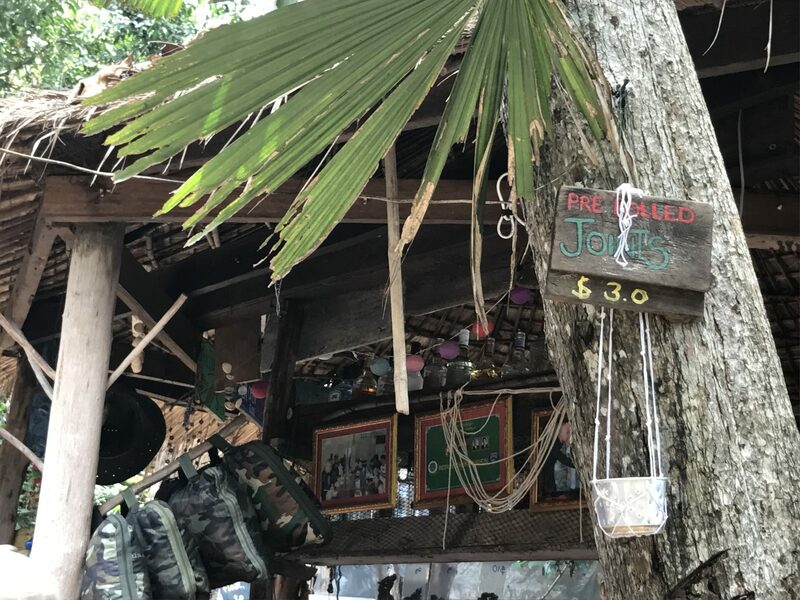 He had in his hands a map of many papers that he walked under our eye at a dizzying speed, and in the next 5 minutes we were alone again on the deck chairs, but the happy owners of two vouchers for the boat that would take us to the beautiful island Koh Ta Kiev. Very quickly we were taken over by a boat in which there were another 10 people and we started the adventure to Koh Ta Kiev. And when I say adventure I do not exaggerate 🙂 The first stop was near a small island for snorkeling. Colorful fish, sea hedges, corals and various other marine life would be revealed to those who dared to put their equipment and leave themselves in the care of the fish. It was not my case. Apparently for no reason, we stayed on the boat and admired the determination of others. In fact, my reason was related to the slightly inadequate bathing suit I was wearing and that I did not feel good about (I wrote about the story behind this swimsuit here). After almost an hour of having fun into the water, while I drank a quarter of the cold juices prepared for us, they all got back into the boat and headed for the paradise island. It’s just that, suddenly, the sea became agitated, black clouds covered the sky above us, and I began to shake. The boat got up and down, and we were not even halfway. I saw an area where torrential rains were in the distance nearby, and I thought that when it rained over our boat, things would get even tougher. I do not know how other people manage to keep calm, but I admire them for that, I panicked, and I was a bit short of asking the barchers to go back. It would have been silly, of course, in addition, I could not get up in the boat because of the increasingly turbulent waves. Time passed very hard, and the island was not visible. Like a miracle, the rain avoided us but, as you saw with your eyes, the waves seemed to be pounding upon us. I was screaming with joy when I saw the jungle from afar and the strip of white shining white beach. The island, of a beauty that is hard to describe in words, is one of the places where you would like to naufragiate. It’s not a joke, that’s what I felt when I reached the unrequited beach of turquoise waters. There are no roads, no cars, and no signal on the phone. The crew informed us that we have 2 hours to see the island, so we headed in a direction where a great stretch of beach was seen. I had seen white beaches before, but it surpassed all of them. Without sunglasses, you could not make two steps, especially since the clouds had risen, and the sun was sending its rays to me well after the drowning episode. Absorbed by the fairy-tale scenery that surrounds us, the left side was large, and on the right was the jungle, we came near a pier where some orange-faced people were agitating on the beach and somewhat amused themselves. In an attempt to escape the hot sand faster and reach the beach bar, I reached the orange people and immediately realized that they are a group of Buddhist monks, children and adults who were there for a picnic. It was like a splash of color between the turquoise water and the cruel green of the trees. We left the noisy group behind, and we went to that bar at the end of the world. After a period of relaxation in the rather rudimentary bar but with a special charm, we decided to go back to the boat because there was lunch waiting for us. The sand was hot, so I went down to the beach with the intention of going through the water. No sign of the Buddhist monks 🙂 It was impossible to believe they left so fast off the island. I took a few steps and saw them in the sea, just their clothes hanging joyfully in the trees. They were funny and they greeted us. We were the only tourists on that side of the beach, we and the monks. The others who came with us with the boat chose to go elsewhere on the island. 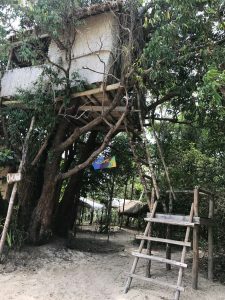 We walked lightly towards the direction where music was heard, and the jungle of Cambodia was interesting: strange noises were heard from all directions, exotic birds waving their wings around us, and weird trees hugged us with the branches to the ground. I cannot express in words the feeling I experienced when we found the bar, and among the cloves and trees there was the incredibly blue and clean sea. Around the bar there were some young nonconformists, a little too relaxed, with the drinks bottles in their hands, and which seemed not disturb by anything. They were in their world, and we were invading that world. We took two beers and went to the seashore, savoring them in the shade of cocoons. Around us there were lots of accommodation… in tents or in wooden houses with space for just two people and without too many walls. The prices for a night spent here vary a lot. If you want comfort, choose a bungalow for $ 20 per night, and if you prefer to sleep in a open building directly on the beach, you pay $ 5. There is also a variant for those with a very low budget, a hammock accommodation, for only $ 2. Is it tempting, or what? 🙂 There is electricity on the island only between certain hours and no internet, no matter what. While I was there, I wanted to have time to discover that island for a few days. I would not have left there, believe me, but the thought of being able to wake up in bed with all the jungle monkeys brought me to reality. There are also some more modern bungalows than those in the trees, but built in the same note, the fusion of man with nature 🙂 I imagine the atmosphere in this decor at night, obviously, no one sleeps, smoky parties take place until the morning and everyone is happy. 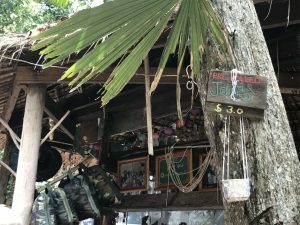 Even if there are very few bars and places of accommodation, almost all of them have the opportunity to prepare pizzas, pancakes for $ 3, chicken or pork sandwich for $ 2.5, or fruit salad for $ 3 and the best beer or coffee that costs $ 1. Not very high prices, if we take into account that all products are brought from the mainland, electricity is portioned and drinking water the same. 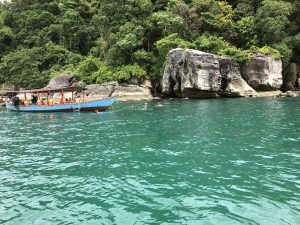 We hardly got away from this place and we went back to the boat, swung something in gear, then went to a place where you could jump off the elephant rock and found the water with the most beautiful color. No one in our group had the courage to jump off the cliff, but we all admired young people who did this with an indulgence of age and desire for adrenaline. Not related to age, maybe just a little bit of adrenaline, Dan made a jump, but out of the boat directly into a coral. And if last year he hurt his feet at a foot massage in Thailand, this time, respecting the tradition, was cut into a coral. And as for the painting to be complete, instead of coming out of the surface, he ventured after the marine fauna, stretching our patience to the maximum. 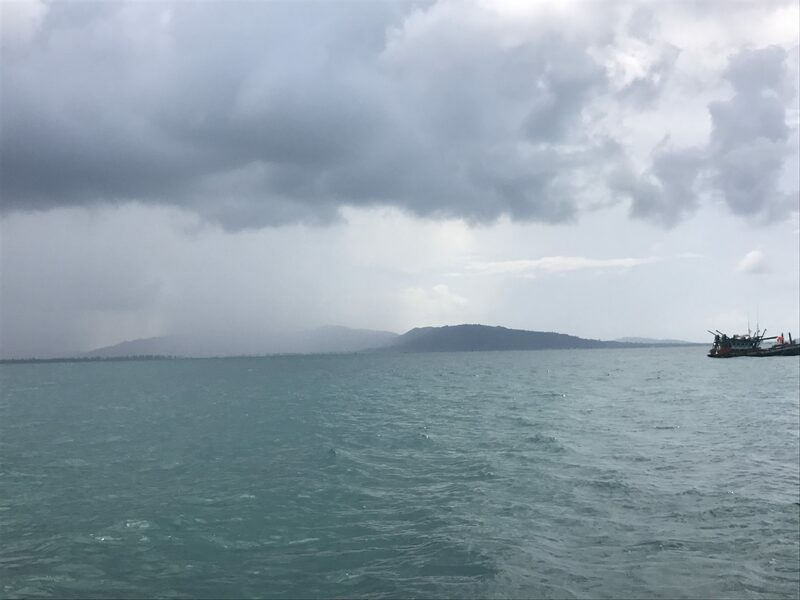 The road to Sihanoukville was no longer as thrilling, the cloudy clouds had disappeared, leaving room for other gruesome formations ready to be immortalized. We returned to Otres 2 right at sunset, a sunset as spectacular as most of those in Asia. There was a dinner I enjoyed at one of the terraces near the complex where we were staying and during which electricity was interrupted again, and we took a bath in the sea, surrounded by plankton, the phosphorescent lights that kept us company until midnight. Did you experience a similar experience on an island inhabited by very few people? If not, would you like such an experience? Subscribe to my blog and you will find out first when I publish a new article! Until next time, I leave you with more pictures of Koh Ta Kiev here. It`s a very nice experience 🙂 Thank you for your visit! Thank you for your kindly words! Cambodia it`s an amazing country and you still can find there some untouched and beautiful islands. The food is also very tasty and the people are very friendly:) Thank you so much! 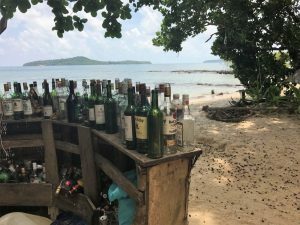 I heard of Otres, but I never got a chance to visit the beach when we went to Cambodia! With only 10 days there wasn’t much time to do much beyond Battambang, Siem Reap and Phnom Penh. Now I have something else to add to my list for when I return– much appreciated! I have bookmarked this post! Heading out to Cambodia next year and this looks like my kind of place, jungle and beach. 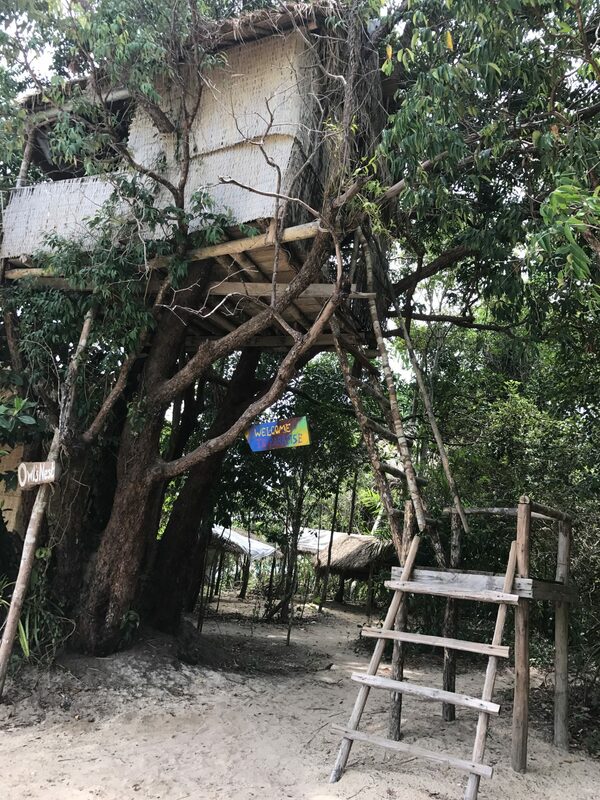 The Tree house sounds perfect…. this whole place sounds perfect! I love it when you read about places that you have never heard before, sounds like you had an awesome trip, thanks for sharing this place and the tips… cannot wait! I’m so ignorant about Cambodia — I didn’t realize it had different islands! Good tip to bring a flashlight due to the electricity. I imagine this would be a nice escape with the lack of internet! This place looks incredible. 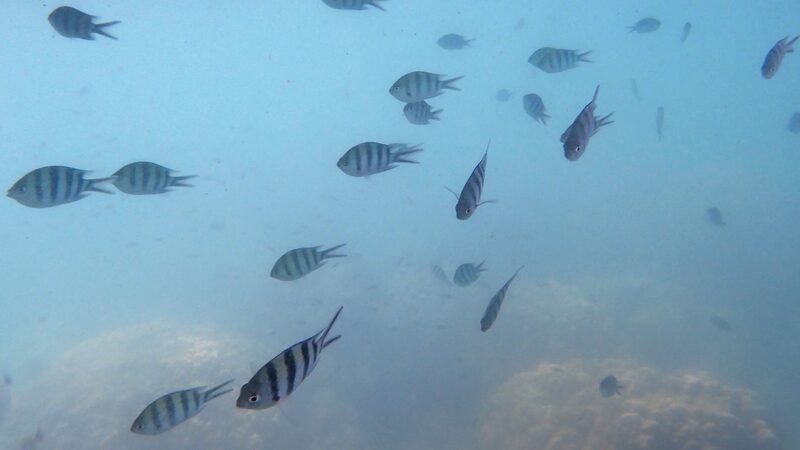 I love anywhere that you can snorkel and enjoy the beautiful sandy beaches. Thanks for sharing, adding Cambodia to my travel list! Koh Ta Kiev looks so beautiful! 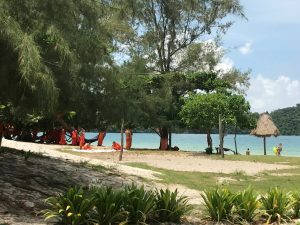 I’ve only been so Siem Reap, we then moved on to some of the Thai Islands, but this island looks like paradise. Definitely adding to my travel list! You are so freaking brave! No electricity, no internet, and monkey possibly stealing your stuff? and BUGS? ACK. But it looks so incredible! I really want to go there, I loved your story! I’d have jumped in for snorkelling, even with my clothes if my bathing suit wasn’t appropriate: I love watching marine life. Phosphorescent plankton sounds amazing. And monkeys visiting at night is probably weird but I’m sure it creates fun memories!! Thank you for sharing! What a beautiful island. Truly a paradise. Thanks for sharing this. It’s my first time to read about this island. Thanks for the tips too. This sounds like a great place to really Get Away and free from distractions. How often are the electrical interruptions? Also what was the local solution against mosquitoes? I am unfortunately too irresistible to those insects and end up with bug bites even in colder climates. Thanks for sharing such helpful tips…I really want to go Cambodia and feel like i’d enjoy this experience! Haha those monkeys though! Very thorough write up of Koh Ta Kiev! Cambodia has so many beautiful islands and with this one being so close to Otres it’s really convenient. Glad you got to explore this beautiful place!